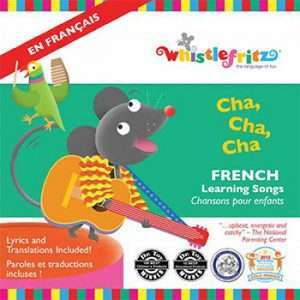 Embark on a musical celebration with this lively collection of 15 French children’s songs from the award-winning series of Whistlefritz language programs for kids. Your French-learning journey begins with a tour of the French-speaking world with On parle français (We Speak French) and Tu habites où? (Where Do You Live?) The party continues with irresistible celebration-themed songs – Halloween, Thanksgiving, La chandeleur, La galette des rois, and Mother’s Day – that teach children vocabulary for the family, food, camping, seasons, and much more! The CD ends with the unforgettably beautiful French folksong À la claire fontaine. The songs are performed by award-winning vocalist Rachel Sparrow and musician-composer Didier Prossaird. From calypso and reggae to New Orleans brass and Latin rhythms, the CD’s diverse musical styles are a carnaval for the ears with catchy melodies that kids will want to hear again and again. Lyrics, translations, and a vocabulary guide are available as an easy reference guide for parents and teachers. 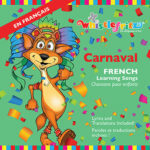 Join the Carnaval and you’ll be singing along in French in no time! Winner of a Mom’s Choice Awards GOLD Award. Winner of a NAPPA (National Parenting Products Awards) Award. Winner of The National Parenting Center’s Seal of Approval. Recommended by the Parent’s Choice Foundation.